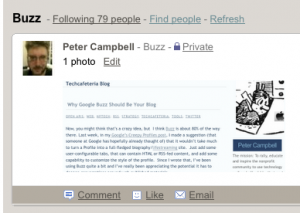 Here’s my take on why, after the shininess fades, Google+ will still be an active social network. First, they’ve learned from mistakes, theirs and others. They learned a lot from the failed Wave and Buzz projects, making privacy front and center; doing uncharacteristically flashy UI design (even stealing one of the Apple guys to do it); and not being too heavy-handed in the rollout. They are leveraging the Google App ecosystem, as Buzz tried to, but this seems like a cleaner and more serious effort — instead of just pasting a social network onto GMail, they’re incorporating apps like Picasa into it. Those of us already drinking the Google Koolaid (and they say that Google Apps is a high priority) will find it very useful (as opposed to redundant, as Buzz largely was). The biggest lesson they learned was to not let people stream pollute as easily as they could on Buzz. I maintain that Buzz is a great platform for communications. It’s the ultimate cross between a blog and blog comments that could foster great conversations and raise the art of information sharing, if we didn’t have to wade through 20,000 redundant tweets to get to the good stuff. Google opened a floodgate of noise there, and too many users — including very good friends of mine — were happy to add to the din. Second, they’ve created something compelling. It out-Facebook’s Facebook for interpersonal sharing and it can stretch to Twitter functionality. What’s powerful here is that, unlike Facebook, where targeting subsets of your friends requires advanced knowledge of the platform and a lot of patience, this interface makes it easy to either have an intimate chat or broadcast info widely. It’s easy to follow strangers that I’m not really interested in conversing with, at the same time that I can have deep talks with my close friends. They really got it right with Circles — friend/follower management on FB and Twitter is ridiculously kludgy in comparison. So, unlike Wave, which was too obtuse, and unlike Buzz, which wasn’t compelling, this is elegant and compelling. It wins people over. Third, they’ve nailed SEO. The early adopters are raving about the hits it’s generating and the great statistics available. That’s going to be a more sticky draw than the shininess. Most of all, they’ve emulated the cool Facebook stuff while shedding all of the annoyances. You can friend strangers here without over-sharing with them. You can +1 a commercial entity (or NPO) without inviting them to flood your stream with ads. You can tell your best friend something without sharing it with your mom. And that’s all easy; there’s no complicated help screen or multi-level privacy settings to contend with. It just works. This entry was posted in Social Media and tagged Facebook, google, privacy, seo, twitter on July 13, 2011 by Peter Campbell.